Tim Cook is a very famous business figure. People interested in high technology know him well as Apple’s CEO. The rest, perhaps, do not know, they are forgivable, but not the president of the United States. 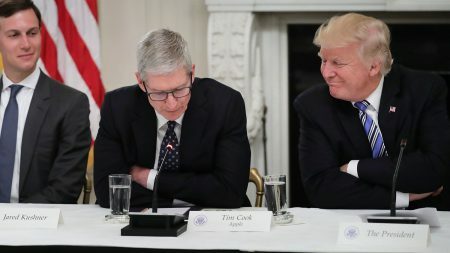 At yesterday's meeting of the advisory board on personnel policy, there was a funny incident – Donald Trump called Tim Cook "Tim Epple." It might have been thought that the phrase said by the US President was taken out of context, but no, this is a complete sentence. So Donald Trump thanked the head of Apple for his company's investments in the country's economy. "We really appreciate it, Tim Apple." The text of the meeting transcript, published on the White House website, states “Tim-Apple”. That is, referring to Cook, the president allegedly clarified in which company he works. Here is a more complete excerpt from Donald Trump's speech. “We are going to open new jobs because we have to do it. We have so many companies. People like Tim, you expand everywhere and do what I really wanted from the beginning. I used to say, "Tim, you should start doing this here." And indeed it is. I mean that you have invested heavily in our country. We really appreciate it, Tim Apple, ”said Donald Trump. The network began to actively discuss Trump's reservation, offering "new" names for other top managers of companies: Ilon Tesla, Bill Microsoft, Mark Facebook and so on. Tim Cook also did not stand aside and has already changed his name to "Apple", but only on his Twitter page. Trump is not the first time confuses last names with company names. So, last year, the president of the United States, giving the floor to Marilyn Hewson, who is the executive director of the American defense company Lockheed Martin, called her Marilyn Lockheed. Perhaps in this way Donald Trump remembers people, associating their names with the companies where they work.